Fall is in the air, can you feel it? Pumpkin Spice Lattes and other fall favorites are back at your favorite coffee shops and the weather is finally starting to give us a little bit of a break. If you enjoy a fall-themed beverage at some point in your day, check out these awesome smoothie recipes from Walk-Fit Sponsor, Nutrition Oasis. You can make them at home or stop by their location in Jacksonville, FL and have them whip one up for you. The best part of these smoothies is that not only are the delicious, but they also serve as a meal replacement. They have over 38 grams of protein in each one, and are a great way to start your day if you don’t frequently have time to sit down and eat breakfast. 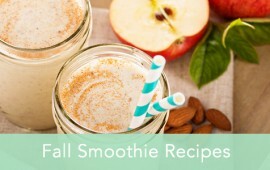 What are some of your favorite fall smoothie recipes? Share with us in a comment below!